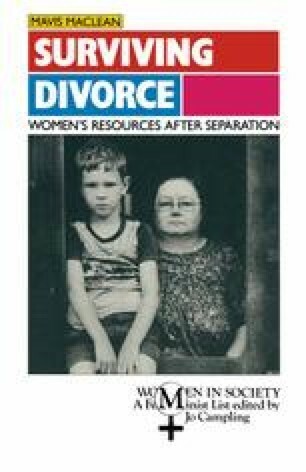 Throughout this book it has been argued that after divorce, women with or who have had children are in a difficult position as a result of losing one household income (that of the former partner) and having damaged their own earning capacity (through career interruptions due to child-bearing). It has been suggested that it is not enough to think of these women as being in the labour market or out of the labour market, on welfare or not on welfare, supported by former partners or not supported. Their incomes are, and will continue to be, made up of various components whose levels will change with time and circumstances, as jobs or new partners are found and children grow up and cease to need day-care and eventually begin to earn. Households headed by women rely perhaps more than other households on an income package. In the USA we have seen that support from a former partner and welfare components in the package are minimal. Women after divorce are therefore relying on their own earning capacity, and as this is not sufficient they are seeking new economically active members of the household, usually a new husband.